Fest Info: “cogNIEscience” had its genesis in the year 2000 by a group of enthusiastic students of mechanical engineering, as a city level paper presentation contest. Over the years, this seed has grown into a national level paper presentation conference.cogNIEscience is a forum where students across India are invited to share information and ideas about the various new concepts in engineering & technology. cogNIEscience urges students to involve themselves in various problems faced by the industry and find innovative and practical solutions for the same. 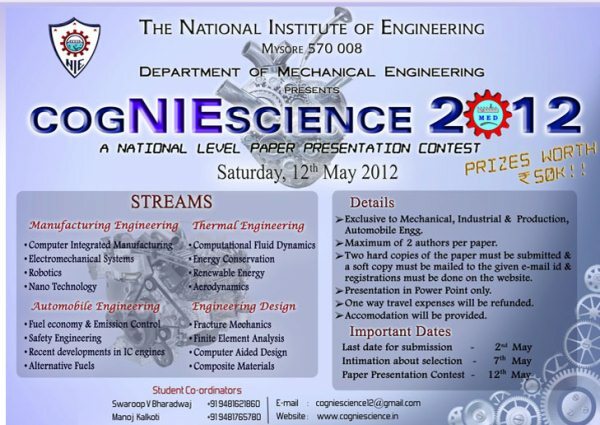 conference styled “cogNIEscience 2012” on the 12th May, 2012 for the Undergraduate /Postgraduate students of mechanical, industrial production and automobile engineeringacross the country. We are into this venture with a view to encourage learning on their own and giving their ideas effectively. 1. A maximum of two authors per paper is allowed. 2. The paper must be submitted strictly in the specified format only. See below for details. 3. Each team has to submit two hard copies and one soft copy (in pdf or doc format) of the paper in a CD only. 4. Contestants are required to provide a working e-mail id, and telephone numbers (preferably mobile) which will be the means of communication. 5. The outstation participants will be reimbursed with one way travel fare on presenting the tickets. Only bare minimum travel fare as per ourinformation will be reimbursed. 6. Accommodation will be provided to the outstation participants. Mysore Train Station to Ramaswamy circle to five-light circle to NIE, Manandwadi Road.